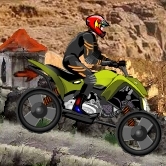 Gear up and select the best four wheel death machine to race in wild areas while performing extreme stunts! Use the arrow keys to drive, number keys for stunts, and dont forget to press the space bar to jump off ramps to gain massive air! Upgrade your ATV in the store to unlock crazy tricks and more!